Cheltenham Gold Cup winner Sizing John is to miss the King George VI Chase at Kempton on Boxing Day, says trainer Jessica Harrington. She said he may run in the Christmas Chase at Leopardstown on 28 December. Defending champion Thistlecrack is set to be joined by stablemates Cue Card and Fox Norton in the King George, said trainer Colin Tizzard. 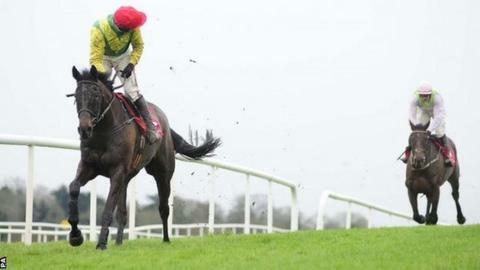 Sizing John, ridden by Robbie Power, was an easy winner on his seasonal return at Punchestown on Sunday. "If he runs anywhere at Christmas he will run at Leopardstown," said Harrington, referring to the race formerly known as the Lexus Chase. "It is only 16 days from his last run to the King George and there is the travelling and everything else." Leading jockey Ruby Walsh, who has been sidelined since mid-November with a broken leg, hopes to be back in time for the Cheltenham Festival in March. "The plaster cast should come off after Christmas or New Year, and is likely to be replaced by a smaller cast," he told Racing UK. "I can then start the physio properly at the beginning of February, which means I should be at Prestbury Park come mid-March."